Then ... First she plays hard to get then Kirsten surprises Joe by suggesting he ask her out to dinner. They meet at the Place Pigalle restaurant. ... a vintage photo ... the restaurant, evoking Montmartre's Place Pigalle neighborhood, was opened in 1953 by proprietors Maurice Stergios and Hans Behringer at 3721 Buchanan Street in the Marina district (map), replacing the former Del Mar Restaurant and Cocktail Lounge. By the time the movie was filmed here nine years later it had become very popular. Here's another look at the interior in an undated postcard photo image. For restaurant history buffs, the earlier Del Mar at the same location was more traditional, a plush multi-boothed place. ... and Now, by 1980 the Place Pigalle had closed down and the building it was in, across Buchanan from the Marina Safeway, was replaced by this one in 1983. By the way, if any reader out there knows of a photo of the exterior of the restaurant in its heyday please let CitySleuth know. 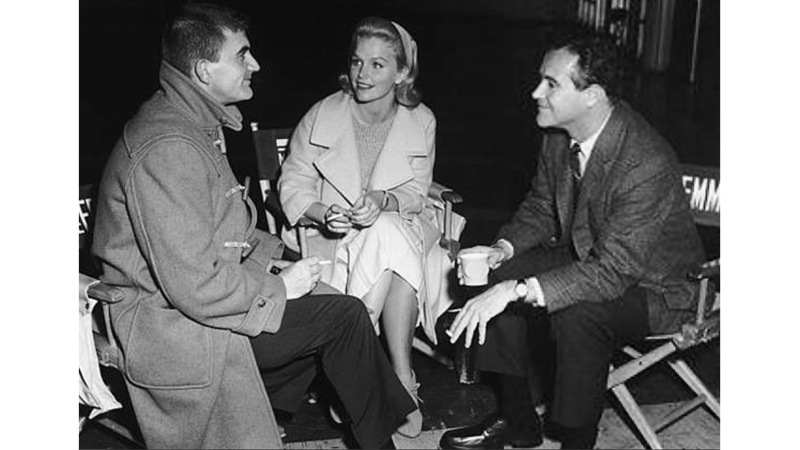 ... on location ... Lee Remick and Jack Lemmon share a smoke break with director Blake Edwards during the location shoot at the Place Pigalle on New Years day, 1962. CitySleuth would love to know how they spent New Year's Eve.